A rogue Secret Service agent who said she “would take jail time over a bullet” for President Trump has been removed from her position following an investigation. Special Agent Kerry O’Grady had been roundly criticized for her comments, in light of the fact that her entire job is to protect the President of the United States. The investigation sought to determine if O’Grady had violated the Hatch Act, something she addressed as being possible within the very post that got her in trouble. While it is welcome news that O’Grady is being removed from her current detail, other agents are concerned that she’ll simply be transferred to a new location. The Secret Service will permanently remove a top special agent from her position after an investigation into her Facebook comments that she would rather not defend President Trump or take “a bullet” from him, but some agents are concerned she will simply be transferred to another government job. 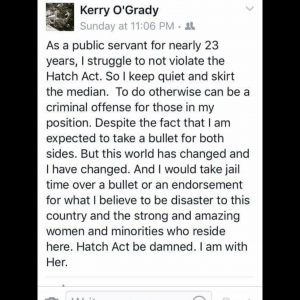 Kerry O’Grady, the agent in question, is on administrative leave amid an internal Secret Service investigation into her Facebook comments about Trump. The report also indicates that top officials at the Secret Service are actively lobbying to protect O’Grady, and current and former agents are worried about the history of corrupt agents being transferred after an investigation to continue their work and collect a pension. The Secret Service has been experiencing a string of embarrassing incidents, including an incident in which a man carrying a backpack full of mace scaled a fence on the south side of the White House and roamed the grounds for 17 minutes, setting off alarms and even managing to ‘jiggle the door’ entering the Executive Mansion. Can President Trump truly feel safe with the Secret Service dealing with these kinds of internal issues?